The Self-Care Sanctuary is an online sacred space that offers ongoing inspiration and nourishment to women who want to strengthen their self-care and soul-care practices as a way into deeper ease, more joy, and simple abundance. The Self-Care Sanctuary invites you to step into the expansive cathedral of your heart and nurture your practice of taking exquisite care of yourself. It's about devoting time - on a consistent basis - to explore practical tools and nourishing concepts that can support a life that feels aligned and deeply nurturing to you. We believe our soul’s greatest desire is to practice love in all things, including the practice of loving ourselves. We also believe an ongoing intentional practice of caring for ourselves while also embracing the holy mess of our lives is some of the bravest, worthiest work we can do. The monthly support and guidance inside The Self-Care Sanctuary is wholehearted, real life support. It's about slowly but surely releasing any hustle energy or need for perfection and replacing it with loving, patient, courageous care for your whole self. Of course, there is plenty of celebrating and deep deep joy along the way. The moment you sign up, you’ll receive immediate access to the online + virtual Self-Care Sanctuary where you’ll find instant access to all the goodness below. Whether you join toward the beginning of the month or the end, the entire month’s content will be waiting for you. You are welcome to join anytime. 1. THE COME AS YOU ARE CONVERSATIONS – A NEW VIDEO EVERY MONTH. The first of each month your Self-Care Sanctuary email will arrive. You’ll get exclusive access to an in-depth, honest conversation where Kelly Rae and I introduce and explore the month’s theme. We’ll bring our truth, our stories, what we’ve learned, what we’re currently practicing, the pivotal moments that changed everything, our collected insights, resources, and more. You bring your journals, open hearts, and willingness to refine and grow your practice. Our conversations will vary in topics each month, but you can always expect radically honest and refreshing conversations about what it looks like to thrive, heal, celebrate, fumble, and love ourselves through a thoughtfully guided self-care practice that sustains our being in the world. By definition, a practice is something that needs to be repeated, with love. Each month, Soul Work Homework will be offered not as a directive but as a loving suggestion to help you engage and deepen your practice. It will most often be a series of thoughtful journal prompts, encouraging and helpful concepts to consider, specific tools to try for the month, book recommendations, inspiring people to check out, and more. If you complete your Soul Work Homework each month, we’re certain your practice will begin to feel more expansive, aligned with soul level nourishment. 3. A RAISE YOUR VIBRATION MEDITATION – NEW EVERY MONTH. Each month, I will lead you through a recorded, theme-specific, guided meditation that can be used throughout the month to support your self-care practice. The mediations are short but potent and are intentionally crafted to raise your vibration and tune your frequency, allowing you deeper direct access to your soul/true self. To know thyself is to care for thyself. These meditations will help you know and connect with yourself on a deeper level so that you are inspired to take exquisite care of yourself. You can listen to the meditation every single day or a few times per week – whatever feels loving and supportive to you. I will also share basic mediation suggestions along the way to help you get the most out of cultivating this worthy practice. Each month, you’ll receive an exclusive – created just for you and available only for you – downloadable mantra art print, created by Kelly Rae. Much like the monthly meditation, it is meant to be used and seen regularly throughout the month. We believe in the power of words. What you say and think starts to shape your reality and something as simple as downloading a gorgeous mantra print, placing it somewhere you’ll see it each day, and reading it daily can begin to reprogram the mind and shape your life with effortless ease. Around the middle of each month, you’ll receive an exclusive invitation to join our Live Self-Care Q + R (question + response) Gathering, hosted via Zoom. You’ll have a chance to directly ask us questions – anything goes – and we’ll dive deep with our responses, sharing stories of what has worked for us, what hasn’t, our resources, favorite books, healers, and more. We’ll always record the live event so you can watch it in the online Sanctuary anytime. 6. AN OPTIONAL, PRIVATE FACEBOOK GROUP. A look at personal ritual + ways to declare one chapter complete and invite in a new one. What it looks like to allow ourselves to be seen and how to be the kind of sister friend we wish for ourselves. How to tap into our intuition, notice and then translate the signs that are showing up in our lives. Exploring the duality of life. How can we care for ourselves AND honor the responsibilities we’ve chosen. How to set loving boundaries, untangle ourselves from other people's stories, and nurture our own independence. Seeing our bodies as both healer and messenger, dismantling body shame and practicing body love. Releasing roles that no longer serve us and unlearning our way back to the remembrance of our essence. Exploring how choosing the path of delight and surrounding ourselves with beauty is a way home to ourselves. Going deep into family of origin versus the family we choose, exploring the healing of ancestral wounds. How to bravely show up for hard conversations, honor your truths, ask for what you want/need, and more. How we can begin to transform our money stories into something more nourishing + abundant. How to nurture, protect, and tend to our own vibration without depleting it or allowing it to be contaminated by others. We invite you to step further into your practice, to slow down, to breathe deeper, to silence the noise, to listen to the wisdom of your own heart. Inside you lives a cathedral of brilliant, radiant light. The Self-Care Sanctuary is a place for ongoing monthly inspiration and nourishment so that you can not only deepen your connection to your light, but to fuel up so you can sustainably radiate it out into the world. Kelly Rae and I have been collaborating and nurturing a friendship for many years. She is a mixed-media artist, author, entrepreneur, mother, and more. She has a master’s degree in Social Work (MSW) and practiced as a clinical medical social worker for years before she began making art. 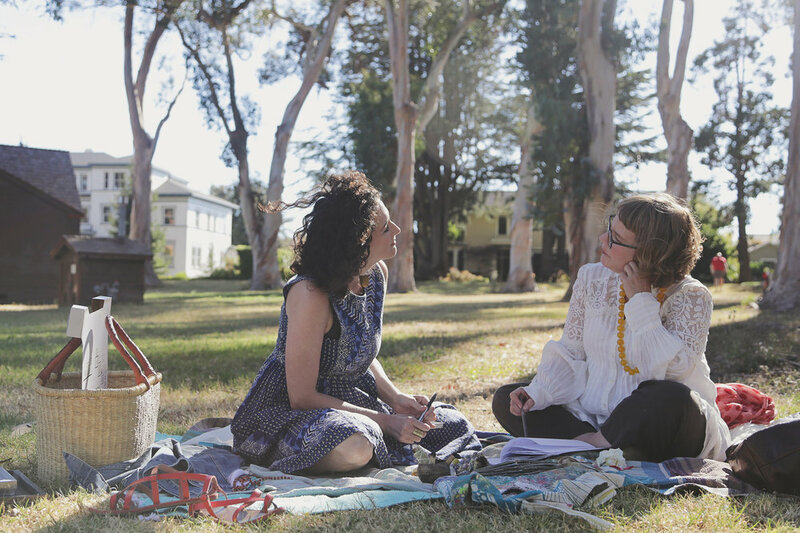 She considers her art business as a perfect marriage between social work ideology and creativity; both have been guiding lights along Kelly Rae’s self-care journey. Kelly Rae says that creating a life of joy, abundance, and ease while keeping self-care and soul-care practices front and center has been some of the hardest work she has ever done. Staying connected to her work and family (hello, partnership and motherhood!) while staying connected to – and caring for – herself has come with challenges, and those struggles have always led to the kind of breakthroughs that lead to more joy, more freedom, and more connection. Kelly Rae is grateful and deeply excited for the opportunity to support other women by sharing her self/soul-care stories and lessons she has learned along the way. The Self-Care Sanctuary is a collaboration between me, Lacy Young, and Kelly Rae Roberts. I am a transformation coach, meditation retreat leader, and powerful space holder. My own journey of self-care and healing has taken me all over the globe. From a solo soul-journey to Bali where I was mentored in ancient meditation practices to a trek to the Amazon jungle to explore plant medicine with a Shipibo-Conibo shaman, my travels have all led me back to one place - my own heart. To me self-care is a lifestyle decision. Modern-day culture wants us to believe a bubble bath and a chocolate bar will mend the deep wounds we feel within, but I know differently. I have seen again and again with myself and my clients that introspection and a deep understanding of self leads to greater care and deeper peace than anything in our external world ever could. My hope for you is that through Self-Care Sanctuary you become deeply in touch with your own heart and desires, that you come to easily define what self-care means to you personally, and that you make a commitment to walk that path. Why? Because you are worth it, because joy is your birthright and because you deserve to be a priority in your life. What do I have to do to make sure my monthly membership continues? Not a thing. Your membership fee will be automatically charged every month via the same payment method you enter when you sign up. My friend / sister / book club ladies would love this. Can I share my access to the sanctuary with them? We love your generous spirit, and the answer is no. If you have friends + family you think would benefit from The Self-Care Sanctuary please send them the URL to this page and invite them to sign up. Perhaps you could be self-care accountability buddies! Surrounding ourselves with friends + family who are also seeking to deepen their self-care practice is a great way to stay connected to your own path while deepening connections with others. If you’re friends + family choose not to join The Self-Care Sanctuary, consider starting conversations with them about all that you are exploring each month in the sanctuary as we’re certain it will inspire in-depth inquiry work for all. And on a related note… Your membership gives you personal and individual access only. Translation = Please don’t copy and share any of our written/recorded content with others, post them to online hosting sites like Soundcloud or Youtube, sell them to others, display them publicly, or use them for commercial or personal gain in any way. Do I have to join the private Facebook group? No, you do not need to join the FB group – it’s 100% optional. If you do join, you can rest assured that it is a closed group, so it’s truly private. Only members can see what you post in the group. Confidentiality is important for us too. The Self-Care Sanctuary is a monthly membership, which means when you sign up, you’ll be billed for the first month of your membership and receive instant access to that month’s content. After that, you’ll be automatically billed each month, on the same day as your original purchase. For example, if you sign up on the 12th of the month, you’ll be billed on the 12th of the following month. You can cancel your membership at any time. Once you cancel, you will be removed from our private Facebook group (if you joined it). You will also stop receiving any new content. All the content you received while your membership was active will still be yours to keep forever. If you wish to cancel your membership, please email hello@kellyraeroberts.com. How does the live Q+R (question + response) work? Can I ask my questions Live? Each month, we’ll host a Live Q+R Session via Zoom, an online web conferencing platform (we love it!). You can ask your questions during the live event and we’ll respond right then. We’ll also respond to the questions that come in throughout the month via the comments section of our online sanctuary. If you can’t make it to the Live Q+R Session, no worries. We’ll have the recording of it available in our online sanctuary where you can watch it anytime you’d like as you’ll have forever access to it. How will I access the monthly content? On the day that you join, and then again on the first of every month that you are an active member, you will receive an email with a link and password to access to our private, virtual sanctuary. Once inside the Self-Care Sanctuary, you will find all of the month’s content. You can access and visit the online sanctuary as much as you’d like throughout the month. You will also have forever access to it should you want to go back and revisit the content in the future. No worries. We’re here for you. For questions directly related to the course and your billing write to hello@kellyraeroberts.com. Something else? Get in touch with me at lacy@lacyyoung.com.